This is a picture of Harry. Probably taken sometime last week. He likes to be involved with whatever we are doing. On the Stitching front I have been stitching away here at home. My new starts for 2011 only number 1. I have put that away and will not pull it out until we move to Kirup. 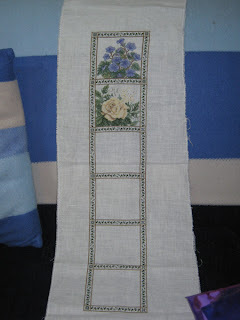 On the other hand I have signed up for a SAL with allstitcherslounge for a Teresa Wentzler SAL. Well if you know me well you will know that I count her as the greatest cross stitcher designer to walk this earth, so I have a few started. I couldn't narrow it down to one UFO so chose 2. The first one is the very first design that I ever saw of hers and the very first I ever started of hers. It is the Floral Bellpull. This was the design that started my love affair with her designs. I have actually finished one of her designs. 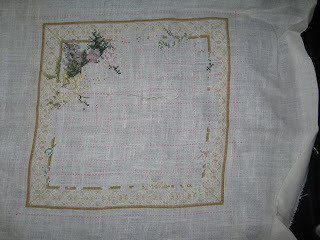 The Wedding Sampler. So here are some pictures of where I left off a good many years ago. The second TW I chose is one of the Fruit and Floral samplers. 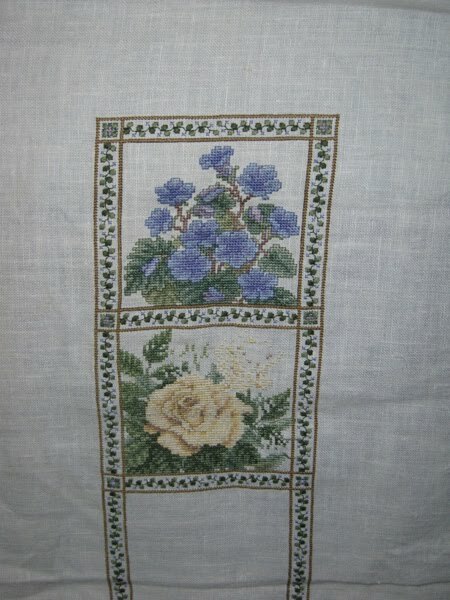 I just love the delicate colours in this sampler. Another UFO. I have many believe me. On the home front Alan is delighted to learn that the people we are buying the house from are selling him a ride on lawn mower with a trailer (he has always wanted one). I am so happy that he is getting what he wants because he so deserves it. And we go down for our final inspection on the 1st May. I can't wait to see my new home again. 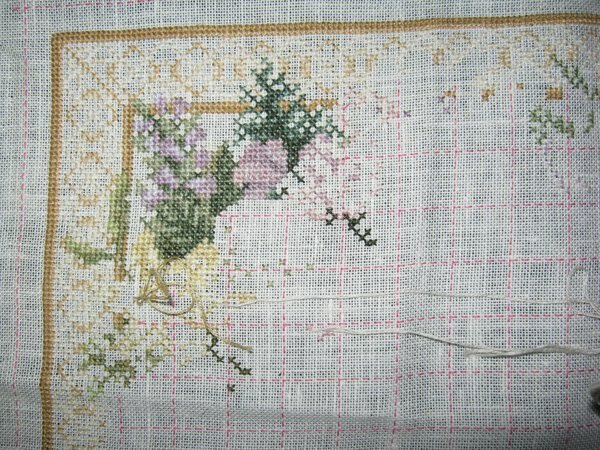 I'll be working on my floral bellpull as well for the SAL. Oh wonderful Measi. I have your blog on my reader so will catch up with your progress on that. Jacob yes your Harry boy. Will try to take more photos now I am more organised. 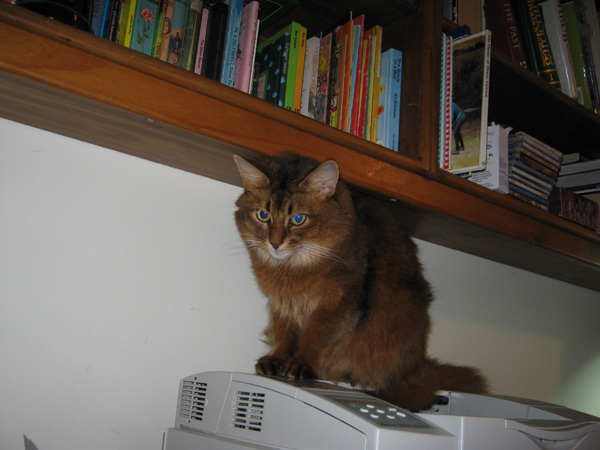 BTW we found the cord for my camera when moving the desk into the study. Hi Janine. I found your blog through Nancy M's blog and wanted to say hi. I'm Julie from Cincinnati, OH and I just made a big mistake. I'm going back and forth from one blog to another and I just told someone else that I loved the two TWs, lol. I saw your blog then switched to hers and my brain totally had a fart. Ah, well, she'll only think I'm crazy!! BTW, I really do love your bellpull. It's beautiful!! Hello Julie from Cincinnati. I follow your blog. I love my Bell pull too. It was the first TW I ever saw and fell in love with her design. I think the only one I don't have of hers is Mademoiselle Mimi. Would like it but wouldn't pay a million dollars for it.